Savoury vegetarian pancakes are great for brunch or lunch as they are super-cheap and easy to make. 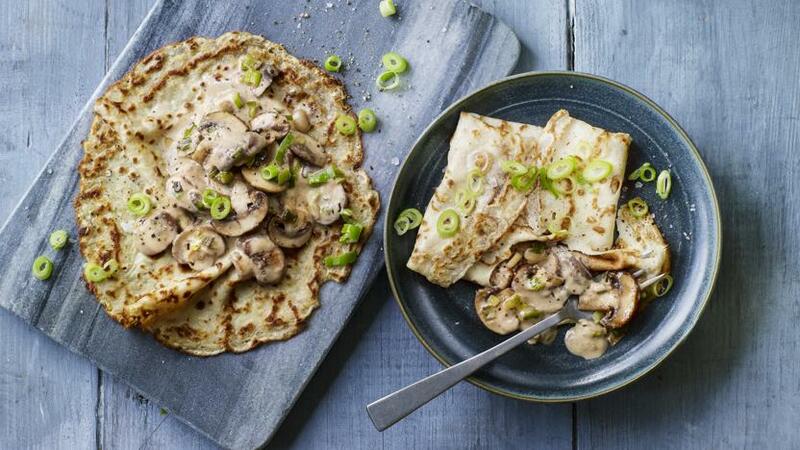 Bring a taste of Northern France to your kitchen with this marvellous mushroom pancake recipe! Each serving provides 512 kcal, 25g protein, 43g carbohydrates (of which 12g sugars), 26g fat (of which 14g saturates), 4g fibre and 1.7g salt. Whisk together the egg and milk in a small bowl or cup. Put the flour into a large bowl and season generously with salt and pepper. Make a well in the centre and pour in the egg and milk mixture. Gradually whisk them into the flour to make a batter. Set aside. Heat the butter in a large frying pan over a medium heat until foaming but not burning or browning. Stir in the spring onions, reserving a little of the green part, and cook until soft. Add the mushrooms and cook until soft. Season and stir in the crème fraîche and mustard. Tip into a bowl, cover with foil and keep warm. Wipe the frying pan clean and heat another small knob of butter until foaming. Tip half the batter into the centre of the pan and swirl around until the base of the pan is covered. Cook until just golden on the bottom, then flip over and cook the other side until golden-brown. Set aside and repeat to make the second pancake. Put the pancakes on a plate and spoon the mushrooms into the centre of each. Fold the edges over, starting with the bottom, to create a square. Sprinkle with the remaining spring onion and serve. Serve with a generous salad dressed with a simple vinaigrette for a bigger lunch. Chestnut mushrooms tend to be really cheap and have more flavour than button mushrooms, but use whatever you can find. Low-fat crème fraîche gives the sauce a beautiful creamy tang, but if you’ve got some cream to use up you can use that instead. If you don't have Dijon mustard, use whatever mustard you have. Once you've mastered how to make mushroom pancakes, read our guide for more easy pancake ideas.